In our opinion, ice cream is the perfect treat for any time of year but now that June is upon us we’re all about fully embracing our love for all things ice cream! 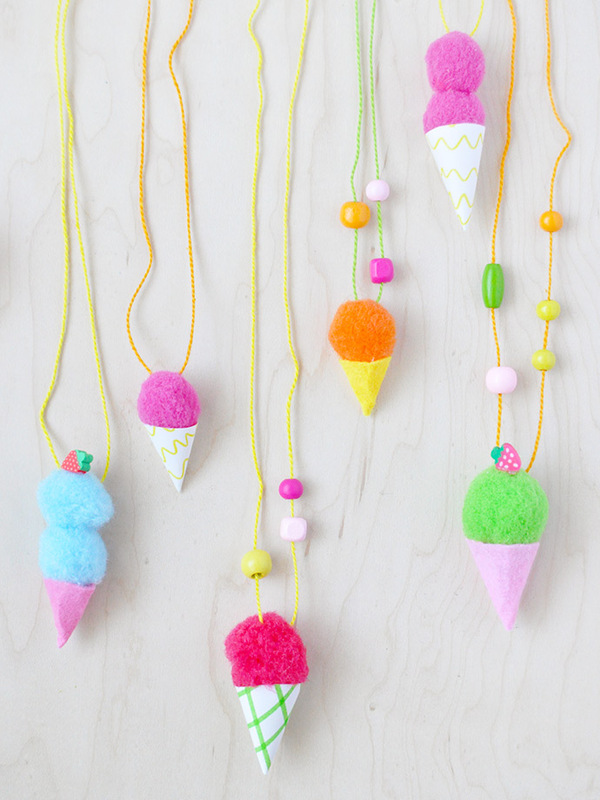 Today we’re making these sweet mini ice cream cone necklaces using our favorite pom poms from Kid Made Modern. 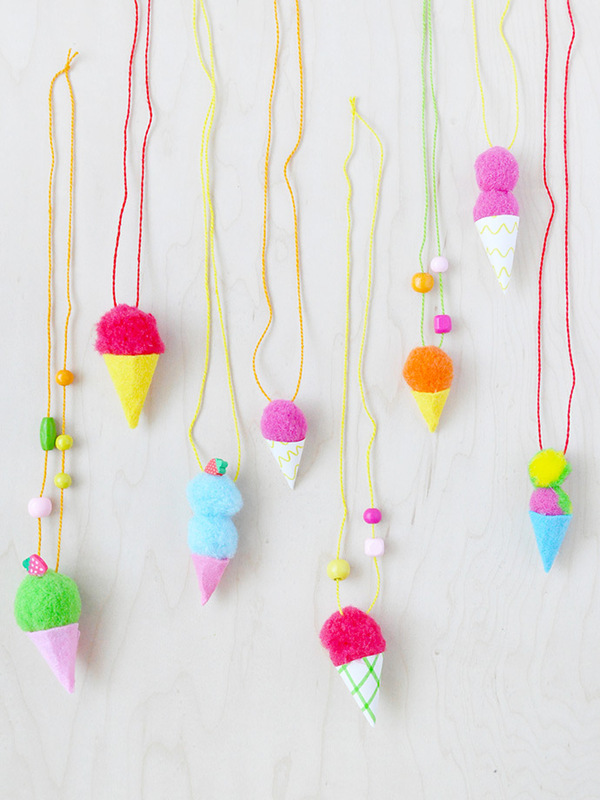 Mix and match pom poms for a whole ice cream parlor’s worth of flavors, and make your own custom cones too! Want a waffle cone? No problem! 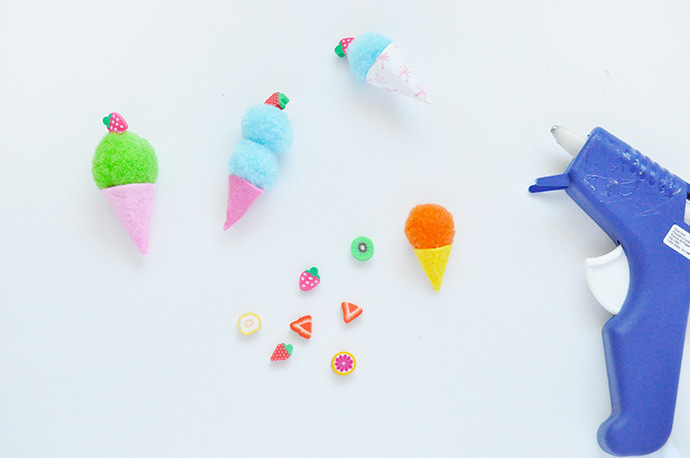 Use markers and paper to make those freshly baked waffle cone dreams come true. 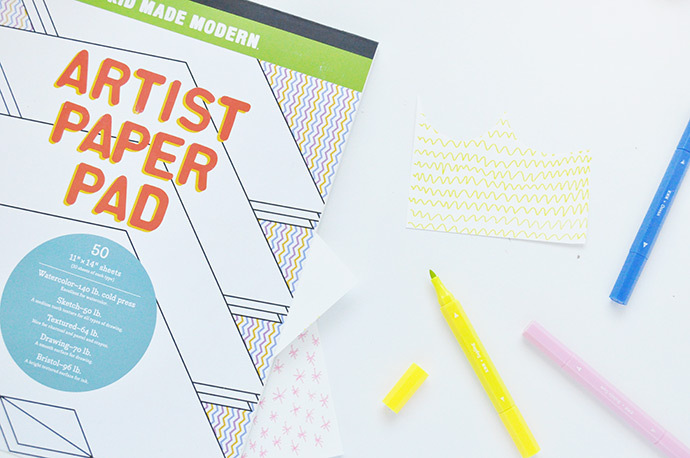 We had so much fun with this project and know you and your little ones will too! This is a great activity for those scorching summer days where you want to escape the heat indoors. 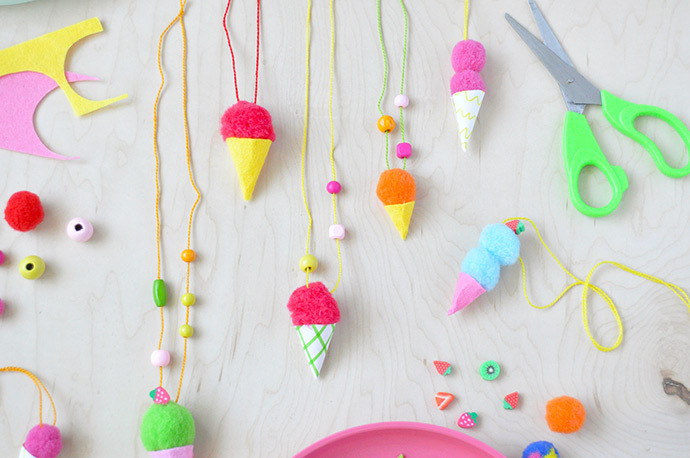 Or, bring your supplies outside and make these necklaces at your next pool party! We kept it at single and double scoops, but you could up the ante and go for some triple scoops, or even ice cream sundaes and banana splits! Once you get mixing and matching flavors and cones, it’ll be hard to step away. 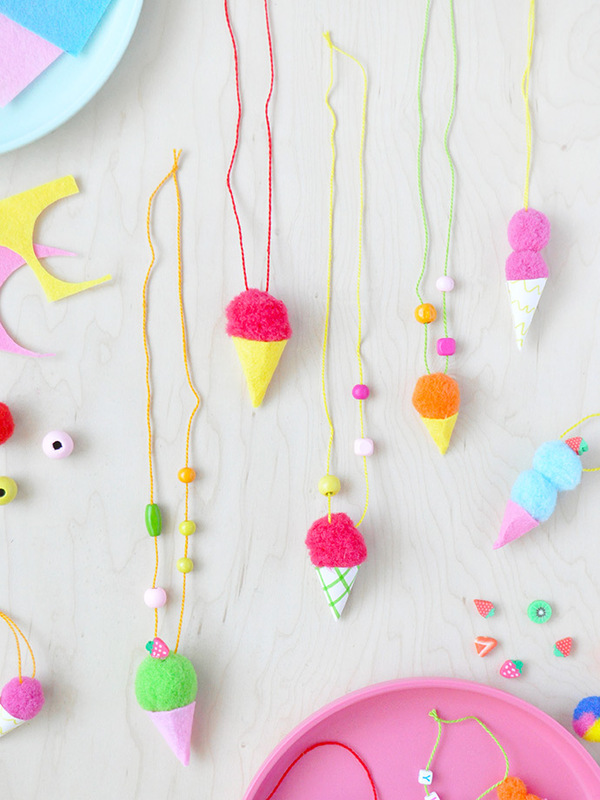 And you don’t have to limit yourself to necklaces or bracelets either – use a shorter piece of string to make a key chain or backpack charm, stick a pinback on it for a playful brooch, or even glue a magnet on for some super summery decorations for your fridge and freezer! 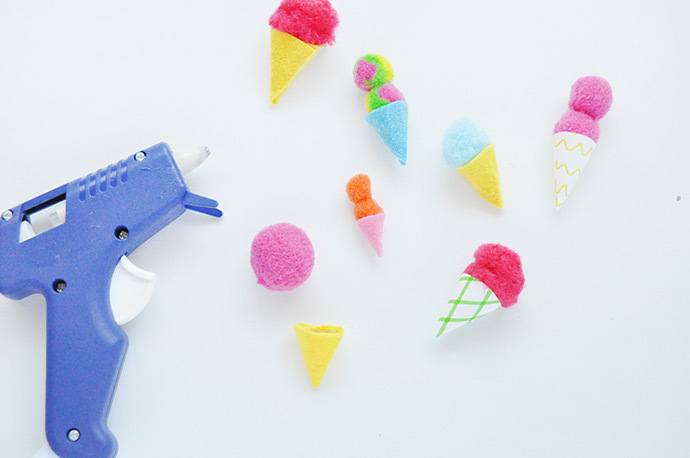 Use markers to draw fun designs and patterns onto paper – these will be used to make the cones. 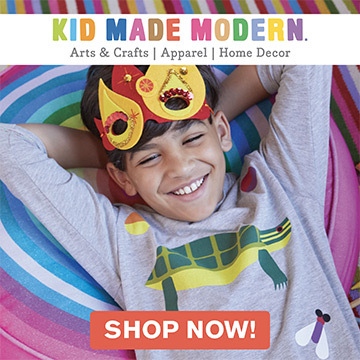 We used Kid Made Modern’s brand new washable double pointed markers – they come in a ton of amazing colors and the option of a smaller or larger felt tip is awesome! 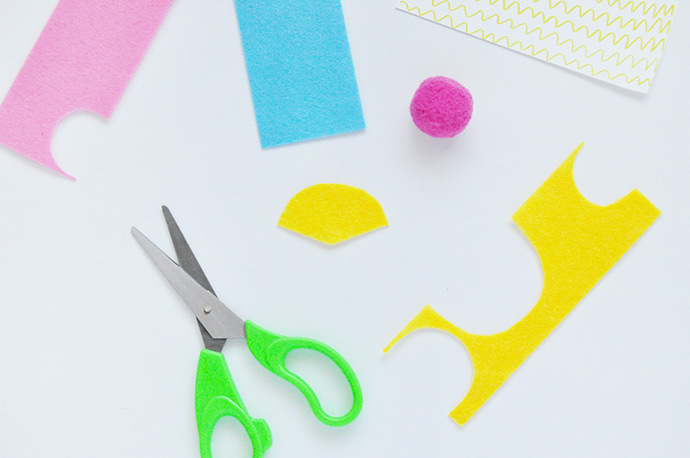 Cut a half circle out of felt, or the paper you just drew on. 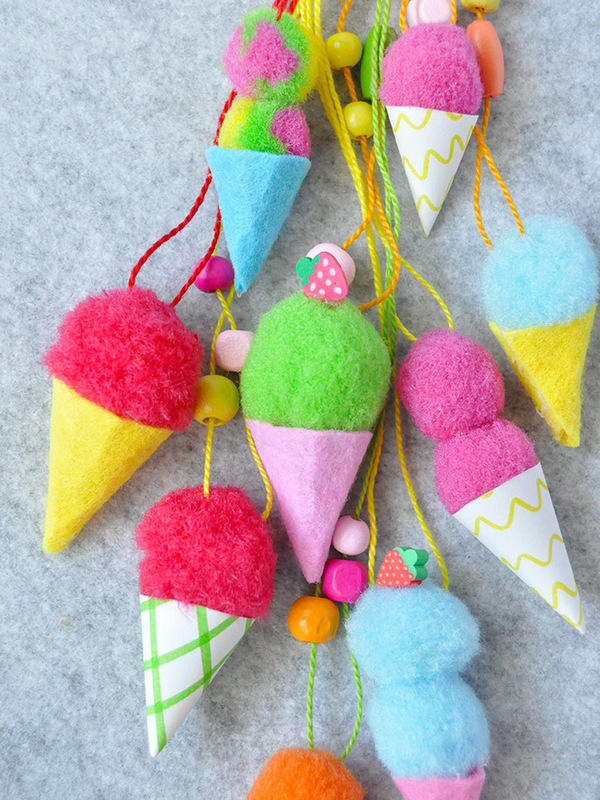 Roll the half circle into a cone and trim it so that it is the perfect sized cone for the pom pom you’re working with. 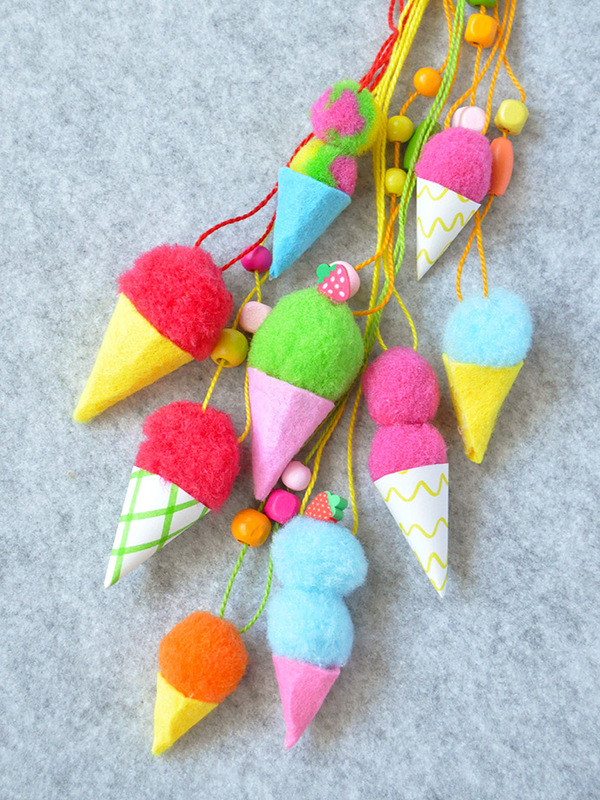 Hot glue the cone in place and then glue the pom pom inside it. 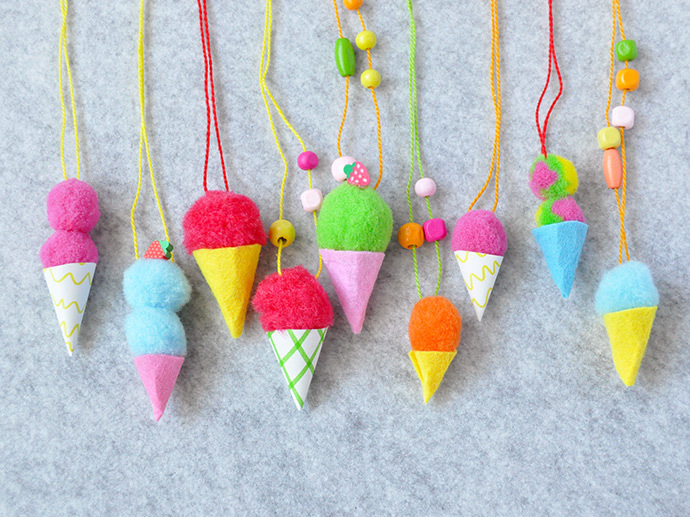 Repeat this with pom poms of different sizes and colors so that you have a whole collection of different flavors. You can also double (or triple!) 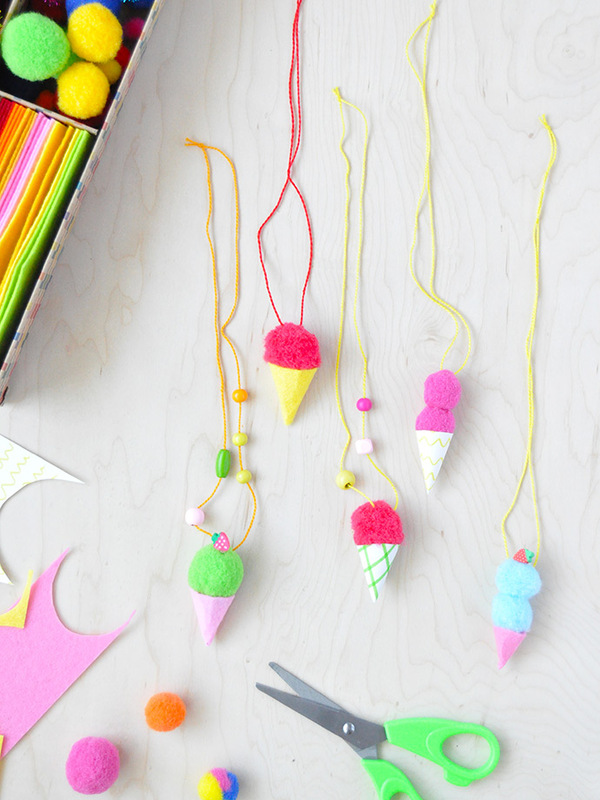 up a few pom poms to make even tastier ice cream cone treats. 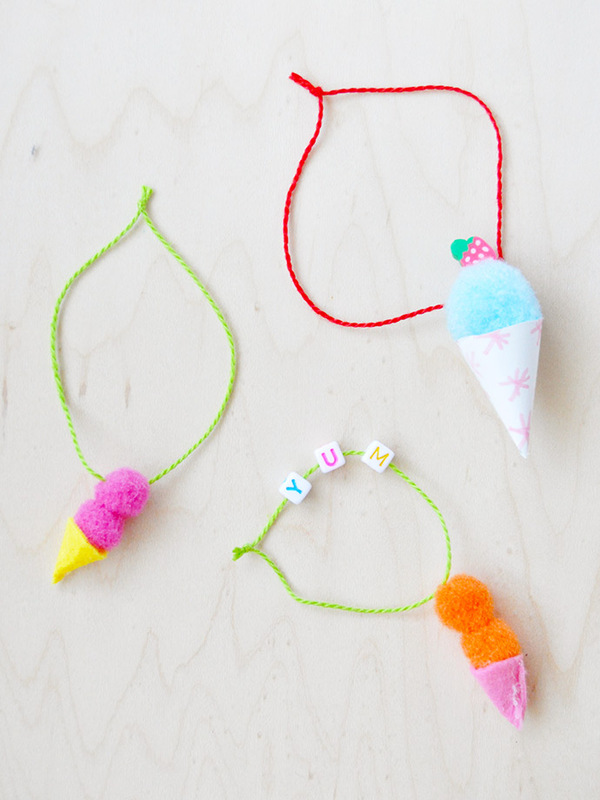 You can even hot glue some mini fruit beads (from the Arts & Crafts Library) on top! 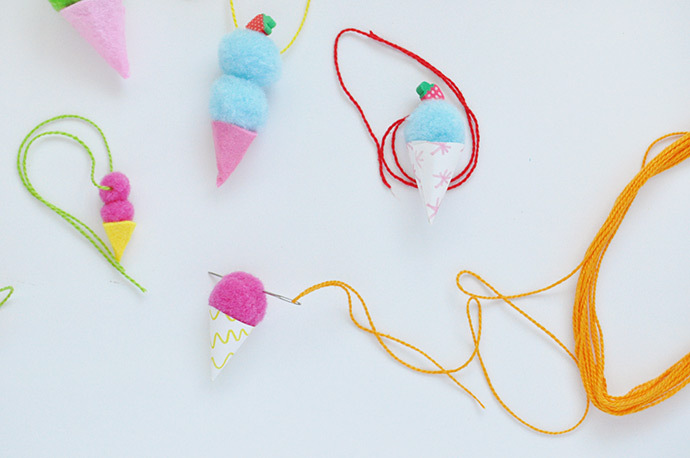 Thread the needle with embroidery floss and pierce through the pom pom. Pull it through and trim the floss to whatever length you like – for necklaces, keep them long enough to fit over the wearers’ heads, and for bracelets make sure they fit on your wrist. 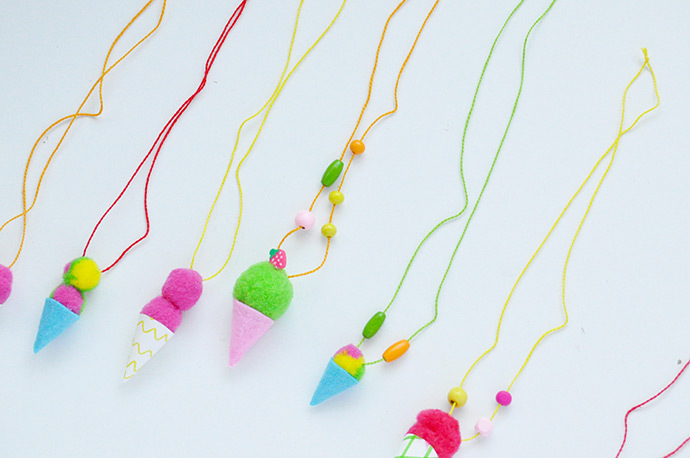 Add some extra beads to the string if you like and then tie off the necklace or bracelet using an overhand knot. 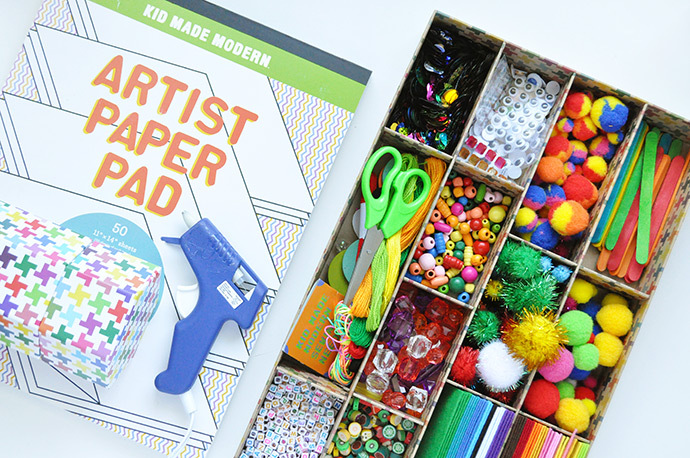 We love how all the supplies in the Arts & Crafts library come in colors that look great together!